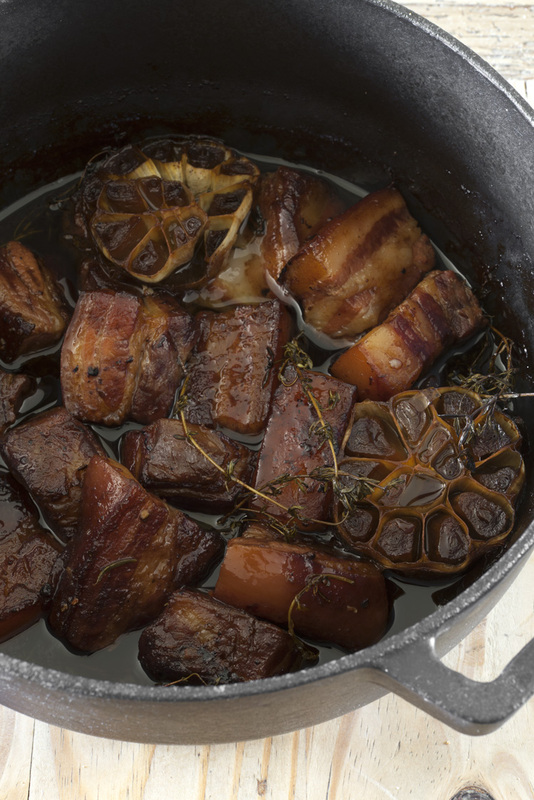 If you’re captivated by the idea of jars of deeply savoury confit pork belly sitting on your larder shelf, ready to be served up whenever you choose, then you should try making rillons – the much-loved speciality of the French region of Touraine in the Loire valley. Pieces of lightly cured pork are cooked slowly with garlic and thyme until tender and giving. They are then either eaten warm, with greens, potatoes and mustard, or packed into large jars and preserved. If potted properly, rillons will keep for several months in a cool dark place. Cut the pork belly into thick strips and then cut each strip into 3 or 4 chunks. Place in a bowl. Combine the salt with the crushed peppercorns and shredded bay leaves and scatter over the pork. Refrigerate for 8–12 hours or overnight. After the allotted time, wash the pork belly pieces in fresh water to remove the salt. Preheat the oven to 160°C/Gas mark 3. Heat a large heavy-based frying pan over a medium-high heat and add 1 tbsp of the pork fat. Fry the pork belly pieces all over for 5–10 minutes until golden and caramelised. You might have to do this in batches in order to avoid crowding the pan. Transfer the pork to a roasting dish or large, shallow casserole. Add the garlic and nestle in the thyme and rosemary sprigs. Add the rendered pork fat, wine and water. Bring to a gentle simmer over a low heat, then cover tightly with foil or with a lid and place in the oven. Cook for 2–21⁄2 hours or until the pork is very tender. To serve the rillons hot, remove them from the cooking liquor and divide among warmed plates. Bring to the table with good mash and lemony greens. To pot the rillons, first sterilise your preserving jar(s). If they have rubber seals, remove them. Heat the oven to 120°C/Gas mark 1⁄2. Put the jars on a clean oven tray and place them in the oven for 20–30 minutes. Remove with a clean tea towel. Carefully lift the tender pieces of pork from the pan and pack them neatly into the cooling jars. Set a fine sieve over a pan. Skim off the fat from the tray or casserole with a ladle, into the sieve. Keep the meaty cooking juices separate – they will make an amazing gravy for another time. Bring the strained, flavoursome pork fat to the simmer, then ladle it, very carefully, into the jars, making sure you cover the pork by 1–2cm. Seal the jars and allow them to cool before refrigerating or keeping somewhere cool and out of the light. When you’re ready to eat your preserved rillons, remove them from the jar and scrape off the excess fat. Serve either warm, heating the rillettes through in a hot oven, or cold with warm crusty bread and sharp pickled cucumbers or cornichons.